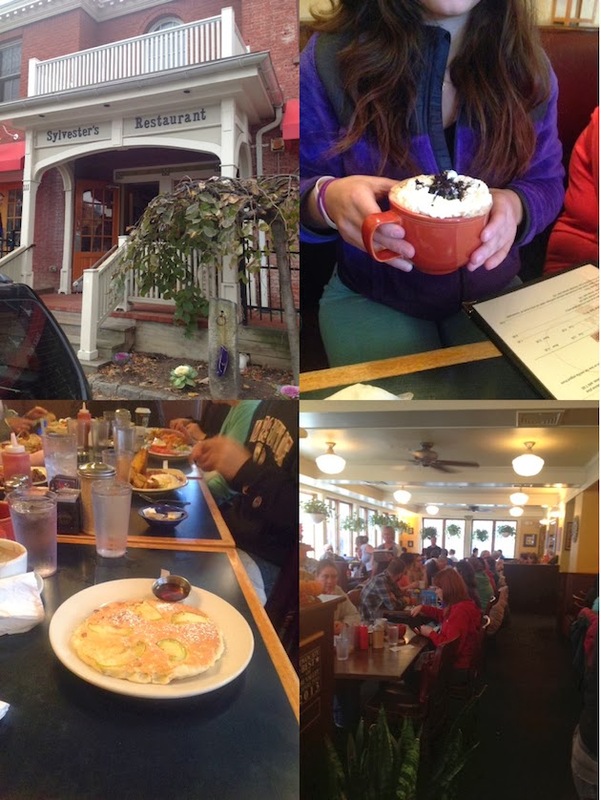 Holidays make me think of brunch and brunch thoughts made me think of Sylvester's in Western Mass. 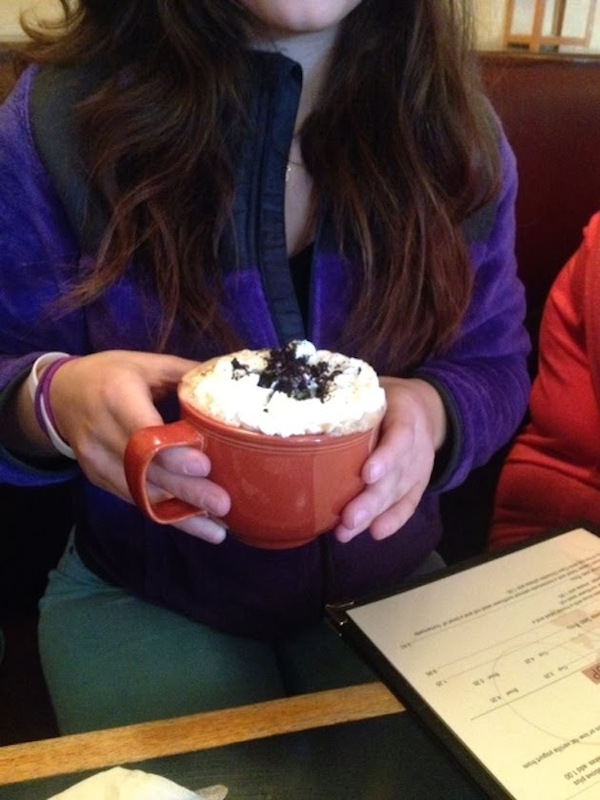 This Oreo Latte above, Jonathan's niece ordered and so well modeled, looks sensational. I am not a big fan of commercially made cookies and sweets, but I have a weak spot for Oreos. I never eat them myself, but with S's allergies, growing up, it was one of the only commercially made cookies he could have and he absolutely loved them. I think he still does. Delicious, fluffy cinnamon apple pancakes. Gigantic saucers. Good I ordered only two and not a stack of three. I don't believe I enjoyed brunch this much in a long while. It was a perfect brunch, almost a throw back sense of a brunch. A weekend gathering with Jonathan's family to celebrate his upcoming birthday mid week, on November 13. It's always a treat to get together with J's great aunt Arky, 98, who lives in Northampton. Sylvester's was her idea to begin with. Arky is sharp and feisty. She said she just can't take her eyes off S, our son, and asked me "don't you think he is so handsome?!". :) You might have seen her photo with Jonathan on Instagram. Arky said going to college was never an option when she graduated high school. Her family just couldn't afford it. She ended up a couple of years later going to college through ROTC and finished with a graduate and post graduate degrees from ivy league institutions. An activist, she's got quite the story. I get a kick out of her and her husband, now gone, George. He was quite the harmless flirt. The photos were shot with the iPhone. No you didn't!!!??? I started going there when I started at UMASS in '89. I'm so happy that you went! Hi Johanna, it took me this long to discover it. Great brunch spot. BTW my son goes to UMASS. Thanks for the tip, Shulie! Looks like a great spot.